The Hotel Riudor is a popular Adult-Only Three-Star hotel in Benidorm and has worked with the British market for many years; the majority of guests are from the UK. The hotel prides itself in the great feedback received from guests. The hotel has a really high repeat client base mainly due to the very warm welcome they receive. 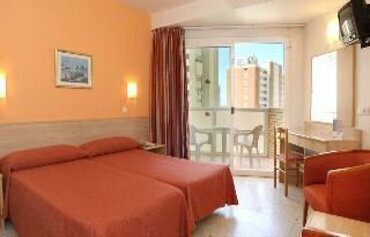 The hotel is situated 150m from the Levante Beach, and is close to bars and restaurants. The hotel has a really relaxed atmosphere. Facilities include a swimming pool, sun terrace, and free WiFi is available in the reception area of the hotel. Entertainment includes dancing, live music and some shows. All Inclusive is available at the hotel during the summer. It is the location of the Hotel Riudor that sets it apart from the crowd. This 3 star hotel is set at the heart of the Rincon de Loix area of Benidorm, with the golden sands of Levante Beach just a short walk away. Reserved exclusively for adults, this friendly property goes all out to make sure its guests have a fun filled holiday. The real crowd pleaser is the pool area. The large rectangular pool is lined with sun terraces, sun beds and parasols. So why not choose your spot in the sun and top up your tan? The adjoining pool bar will keep you refreshed with cooling beers and soft drinks throughout the day. When it comes to food, there are plenty of onsite eateries to tempt your taste buds. From poolside snacks and serve yourself buffets to weekly gala dinners and cooked breakfasts. When the sun goes down, the stylish bedrooms are great places to chill out. A varied line up of evening fun takes place on the poolside terrace area during the balmy summer months. Treats includes live music, bingo, British singers and dancing. For a change of scenery, the clubs and bars of Benidorm are on your doorstep, with party nights and fun and games on the agenda. With its top notch amenities, large pool area and childfree environment, it is easy to see why the Hotel Riudor is a great choice for an adults only holiday in Spain. 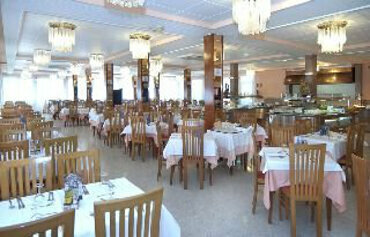 Hotel Riudor has all the facilities you would expect from a 3 star hotel in Benidorm. Highlights include: An outdoor swimming pool with sun terrace, sun loungers and parasols, buffet restaurant, happy hour, pool bar (summer), main bar, free WiFi in reception, currency exchange, TV room, theme park and attraction tickets. Hotel Riudor has 168 guest rooms. The rooms all have satellite TV, air conditioning, telephone, full bathroom, balcony, twin beds and optional safe. Cots are available and mini fridges can be hired. Breakfast and dinner are served buffet style in the restaurant, with Mediterranean and continental dishes and weekly gala dinners on the menu. In the summer months, the Pool Bar is open from 11am to 6pm with a snack service at lunch time. The main bar serves hot and cold beverages from 9am to 1am. Evening entertainment includes live music, bingo, British singers and dancing. 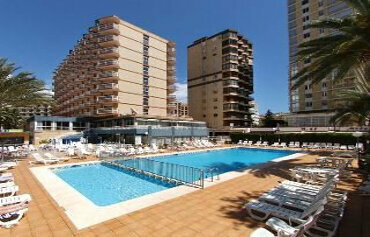 The 3 star Hotel Riudor is located in the Rincon de Loix area of Benidorm. Levante Beach is 150m from the hotel and Alicante airport is approximately 65km away.